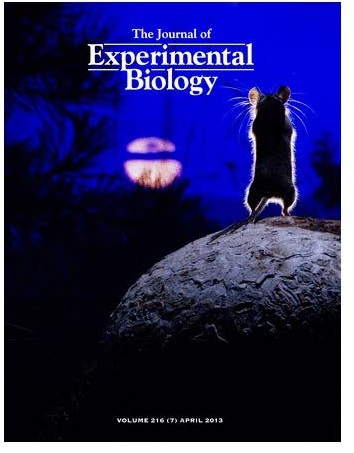 On the cover: A deer mouse (Peromyscus maniculatus) watching a moonrise over the Blackfoot Valley, MT, USA. There are numerous physiological differences between deer mice that are native to different elevations, but it is not known whether these are genetically based or due to phenotypic plasticity. Cheviron et al. (pp. 1160−1166) and Tufts et al. (pp. 1167−1173) measured the contributions of plasticity to altitude-related physiological differentiation. They found a high degree of plasticity in blood−O2 transport capacity, but, relative to lowland natives, highland mice exhibited a significantly higher thermogenic capacity under hypoxia after controlling for acclimation effects. Tufts, D. M., I. Revsbech, Z. A. Cheviron, R. E. Weber, A. Fago and J. F. Storz. 2013. Phenotypic plasticity in blood-oxygen transport in highland and lowland deer mice. Journal of Experimental Biology 216(7), pp. 1167-1173.